Leap’n Lizards is a marketing and design firm providing your business with effective and sensible solutions for print design and web design. Our job begins by gaining a thorough understanding of what your marketing, print or web design needs are. Then, through research, our marketing and design “Think Tank” analyzes the collected data and provides you with a creative and strategic, results-oriented solution. And, you’ll be happy to know, we can work within your budget and make every project a cost effective, blissful experience for all involved. 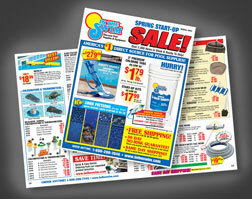 We specialize in the strategic execution of both business to business and consumer catalogs. Our package design has covered a large variety of products including pharmaceuticals, cookies, writing instruments, hardware and CDs. Brand identity development at its best. Signage, annual reports, point-of-purchase and more, driving your brand identity and delivering your message across nearly any medium. Develop or update online brand building strategies while generating an increase in online sales by applying innovative e-marketing techniques. Delivering your targeted marketing message from every angle you've imagined and some that you probably haven't. The first step in making product ideas a reality is sound and detailed illustration that allows for the simplified development of prototypes and finished goods. For a price quote, more information on Leap'n Lizards services and capabilities, or to discuss project specifications, please contact us. The Leap'n Lizard team is a group of seasoned advertising and marketing veterans with a passion for putting ideas into action. Leap'n Lizard provides the design ingenuity and creative flair that make clients "leap" with joy. With expertise in catalog, direct mail and print design, as well as web design, packaging and illustrations. Leap'n Lizard also provides the marketing whiz-bang necessary to make the good ideas great ones. Integrated direct marketing in B-to-B and consumer markets and experience in international marketing, list and database marketing and e-commerce marketing – We have the ability to take any gem of an idea and create the results you're dying for. Masters at quick turnaround and solid solutions, great design sense and big picture capability allows you to simply tell us what your goals are, and watch it all happen just the way you want it. Our creative concepts and ability to make it all come together on- time keeps clients happy and coming back for more. Click image to view an 800 x 632 version.